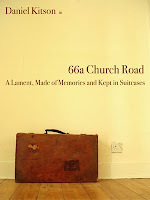 Last night I saw comedic poet Daniel Kitson’s latest show, 66A Church Road: A Lament, Made of Memories and Kept in Suitcases. Amongst his many areas of brilliance, is the ability to bring strong senses of personal recognition from audience members to the situations and feeling he expresses on stage. I was no exception, with probably the strongest and most profound moment of self recognition reserved for his comments about haggling. Haggling – the process of arriving at a final price for a good or service by offer and counter-offer – is something the tabloid media tells me is quite natural and that I should always be prepared to engage in. Quite simply, Kitson despises the practice and, though I’ve never admitted it before, so do I. I realise that much of this disdain stems from my excessively non-confrontational personality. But a smaller, perhaps more noble reasoning lies in the desire not to encourage the way of being that haggling suggests. By that I mean a way of being based on the following premises….. Premise one: I will employ my gifts and labours in the production of something and I will price it above what I think is a fair fiscal recognition of that employment. Premise two: You will then attempt to beat me down to a price that you, without any reference to the creative process behind the good or service, define as it’s worth to you. Premise three: If the outcome of premise two is a price greater (or equal to) than my fair price, then a transaction occurs. Orthodox economics (or, what we've convinced ourselves is orthodox) tells us that, if a transaction occurs, this is an excellent outcome because you’ve paid what you think it is worth and I have received more than a fair fiscal response for my efforts. It greases the wheels of commerce. Yet the “more than” and the “what you think it is worth” suggest that the power dynamics and sense of honesty in this process, aren’t what they could be. Imagine if we could each put our fair, base-values on the table and, if appropriate, negotiate from there. We could understand how each party truly values things from their perspective and see, from our position of full awareness, whether any merging of the values was possible. Now that would be a truly different conversation.